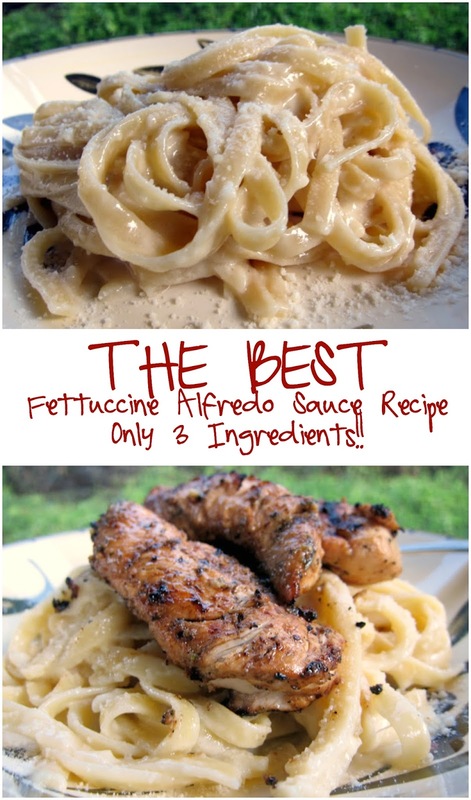 THE BEST Fettuccine Alfredo Sauce Recipe - only 3 ingredients!! Top with grilled chicken for an amazing meal! Ready in minutes!! Better than any restaurant!! A great easy weeknight recipe! I found this recipe via Pinterest. (I am totally addicted to Pinterest, but that is a whole other issue!) The recipe is from Russell Bellanca, the chef at Alfredo of Rome in New York City. 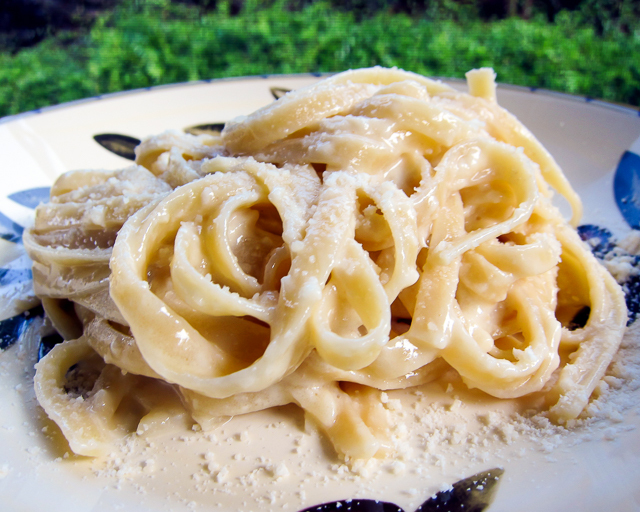 It is said to be Martha Stewart's favorite Fettuccine Alfredo recipe. Well, we can certainly see why. It is AMAZING! It was the best Fettuccine Alfredo that we have ever eaten. Seriously!! The best part about the recipe is that there are only 3 ingredients! My version actually had four ingredients; I added some garlic powder for extra flavor. 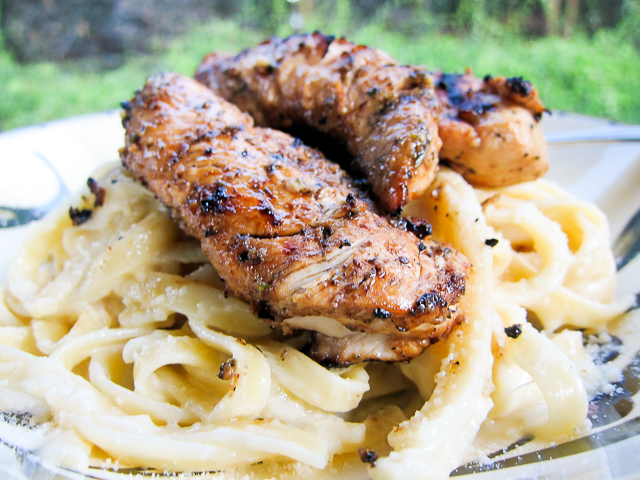 We served the pasta with the Grilled Italian Chicken Tenders from yesterday. Next time we are going to serve it with our favorite Blackened Chicken - I can not wait!! This is obviously not something to eat all the time, but it is the perfect special occasion dish. We both felt it is worth every single calorie! Using an electric mixer, beat butter, garlic powder and Parmesan until creamy. I love alfredo, but like you said I eat it sparingly. It looks delicious, especially topped with the the chicken. lol...I can see that 2 sticks of butter could deter you from having it often. I made that italian chicken last night with slim cutlets for sandwiches. It was delicious! I've got three leftover and cannot wait to chop them up in this recipe tomorrow!!! Your recipes are fantastic & easy. Do you melt, soften, etc the butter? Just wanted to clarify! Thanks! CampMama - you just softened the butter. I'll go back and add that to the recipe - Thanks! I am going to dream about this! Isn't it amazing how the simplest combinations of ingredients can taste so fantastic? I will be trying this one. Made this last night. EXCELLENT! Thanks for sharing the recipe! Alfredo sauce is easy to make. But it is tricky to to do it very well! Yours looks like it has the perfect consistency. Nice job, Steph. Made this tonight! Thumbs up from all members of the family!! Delicious! Shelly - so glad everyone liked it! Pinterest is the reason I was lucky enough to come upon your blog...........THANKS PINTEREST!! Yes I'm newly addicted also. Alfredo without the cream this is a definite try recipe. Off to search for a chicken picatta type recipe. I LOVE you!!! I have made the cheddar bacon pulls, taco cupcakes, and now this alfredo... my husband is in love with you too! Crack potatoes are on for tomorrow with some ribs. Thanks for sharing your secrets, you're makin' me look awesome! Hey. I made this for the first time tonight and while delicious I found this salty and I didn't even add the salt. Did you use unsalted butter or salted? I think next time I may use one stick unsalted one stick salted and not add in extra salt. Looks awesome! I just found your site this week and I will be making lots of recipes from it! I love to try new things but most recipes are too fancy for us-- we are very much meat & potatoes kind of people (and originally from Alabama! Roll Tide!) so these are perfect for us. One question on this one; sorry if it's a stupid question. Do you use can parmesan, bag parmesan, or do you actually buy a block of parmesan and grate it fresh? Thanks! Carrie - you can use the bag of grated parmesan cheese. I also like to buy the tubs of by DiGiorno or the Publix brand. Enjoy! My son and I have declared this awesome. I am to make this at least twice a month he says. I saw this recipe when I watched "Martha Stewart's Cooking School" show last night on PBS and I can't wait to try it. Thanks to Steph (love your site) and all of you who wrote reviews to let me know it's as good as it looked on the show ... LOVE, love, love simple! Surprised there is no heavy cream in this?? ?